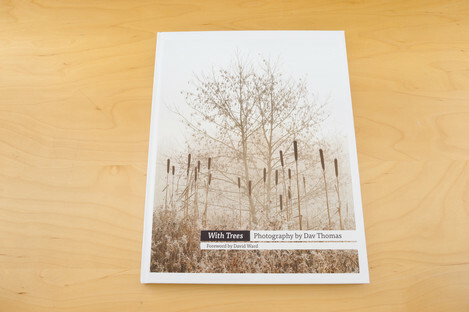 Ok, I’ll admit in advance that I’m a bit biased when it comes to Dav Thomas’ first book “With Trees”. Dav has become a good friend since we both started shooting large format at the same time back in 2007 and since then we’ve lead workshops together and gone on a few, usually quite wet, photography trips. Over that time our ideas about photography have developed and whilst I was germinating the idea of On Landscape, Dav was busy working his local patch developing a quite contrarian idea of what makes a good picture. Over that time I think more than a few people have been inspired by his take on landscape photography and it was no surprise to me that he has developed quite a following. When I heard that he was getting a book published and funded by David Breen and his new venture Triplekite Publishing, I knew it ‘should’ be good as I’ve also worked with Dav in his role as a designer and we’ve mocked up a couple of book ideas ourselves (although quite typically we didn’t get off our arses and finish them off). I purposefully didn’t hassle Dav to see mock ups of the book as I wanted to get an impression of it as a finished project and so my first view of the book was at the same point as everyone else, when the first deliveries went out at the start of July. The book is sold in a set of different editions and I plumped for the luxury edition with slip case and prints and the book arrived with a custom screen printed cardboard protector box and inside this a subtly UV printed white slip case protects the book itself. Pulling the book out of the slipcase was a bit of a tense moment - had Dav and David pulled it off and produced something of great quality? 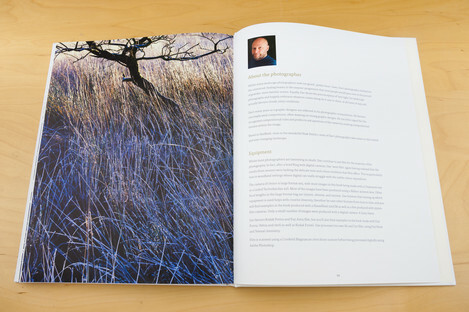 Well in short, yes - the book is oversize hardback and the front cover shows one of Dav’s most popular images, the bullrushes in the mist (and for anyone who thinks Dav is a luddite film junkie, digi-denier - the front cover picture is from a Sony A900 and not the only digital in the book by a long way - try picking out the iPhone 3 picture!). 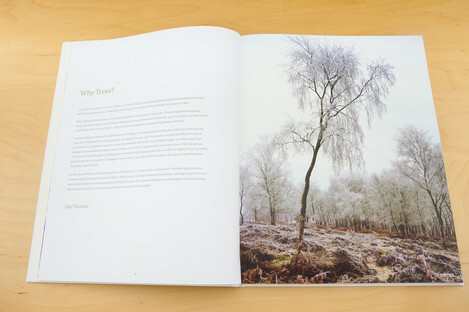 Cream toned end papers wrap the book and the title page echos the cover with a common theme through the book - that photographers friend, the misty woods. 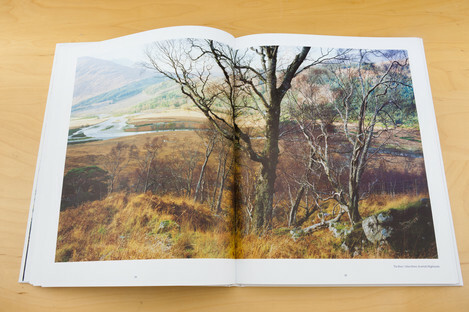 David Ward’s foreword describes the difficulty in photographing in one of the most complex environments in the landscape but also one of the richest. For David to be in awe of Dav's ability to create order out of this environment is fine praise indeed and this introduction to the book is a distillation of what it is to be a photographer. Well it’s a good question! Why would a photographer choose to eschew nearly all other subject matter and commit themselves to a single subject matter? 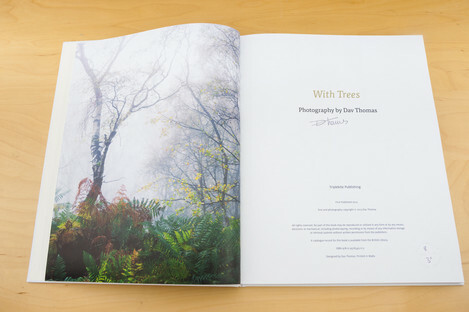 Dav’s introduction tells of a connection with the woods but I think we can summarise this by saying it’s where he feels the most connection and the most engagement. This connection and engagement in turn has developed his vision of the environment. For all that Dav might wander to other subjects in the future I can’t see him abandoning his second home for long. 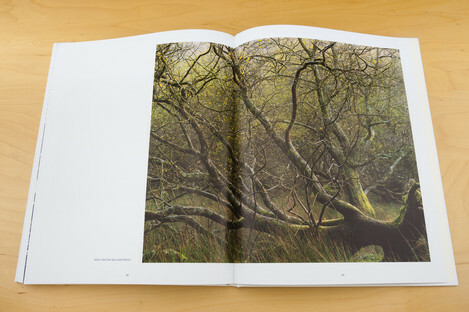 The book doesn’t pretend to be a guide to photography or a discourse on the environment - the contents are simply the images that Dav has produced interspersed with six short quotes about a small selection of images giving us a window into his attitudes and approaches to the landscape. As a friend of Dav’s we’ve often shown each other images as they’re developed or post processed and it’s nice to see a flow of images over a long period such as this but when these images are edited down into a coherent set and then arranged and coupled creatively, the images become a story, a narrative of the landscape. Dav’s passions become clear throughout the book - the transformative changes of the seasons and the weather bring the environment to life. A copse that is the one hand dull and monotone in a summer sun becomes an intriguing webwork of subtle colour in an autumnal mist or frost. 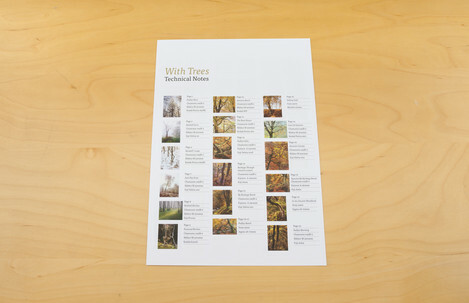 Although the theme of the book is obviously trees and the cast includes these colours and transformations, the book is what it is because of the shapes and forms that Dav brings to the landscape. In nearly every picture Dav rejects notions of compositional formula and relies on a natural sense of balance and form to create order. The creation of the picture is a testament to attention to detail - every intersection of branch and frame, each mirroring of gesture and form is considered. 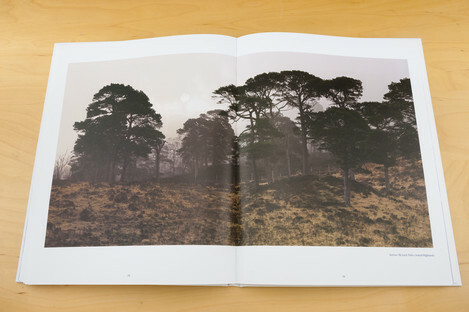 The pictures rely on a sense of dynamic balance that is part overt and part instinctual where the trees become characters in a play of form, reaching and bowing for the camera. 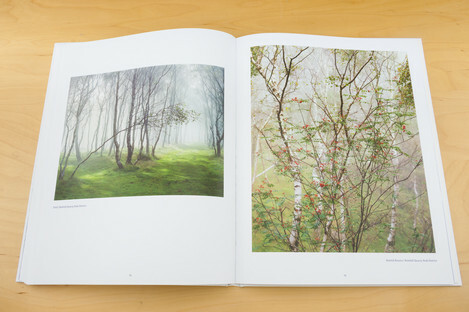 For a book that just includes images of trees there is very little repetition (at least in my eyes) as even a small place like Bolehill in the Peak District, a few hundred square yards, provides at least 10 images in the book, all very distinct from one another. In fact unlike many photo books I can happily open it and be almost certain of finding a spread that will engage my interest; each return visit is rewarded well. Book printing is a world unto itself and the options are endless and quite baffling - as part of this issue I’ve written an article on how photographic images are represented in lithographic printing because I found it difficult to just write “Dav’s book is printed beautifully”. 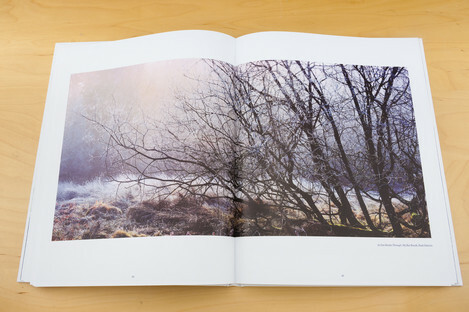 In short (and without reference to the article this may sound a bit geeky) the book is printed at very high resolution (240 lines per inch against a typical 180 lines per inch) with a technique called ‘Sublima’ which gives better colour and tone transitions in the highlights and shadows. All of this geekery, and the fact that most images were taken on large format, means you can stick your nose right into the book and still see more detail without a distracting dot pattern. 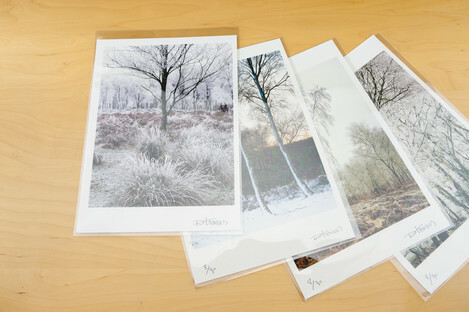 This and the fact that the book is 270mm x 345mm and printed on 170gsm matt/satin paper means the images are on a par with decent sized inkjet prints. 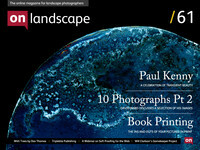 If you get the standard book that works out at 50 pence per print! (although cost per picture is perhaps not the best way to look at a fine art book purchase...). So given this slightly gushing review, are there any negatives? Well the slip case is one of the only weak points in my opinion - it doesn’t seem as well finished as the book itself - and possibly the cardboard containers flaps could be a bit stiffer to make it easier to close. As you can see I’m having trouble being critical (or some people might say ‘objective’). Find out more about the book (and buy it!) 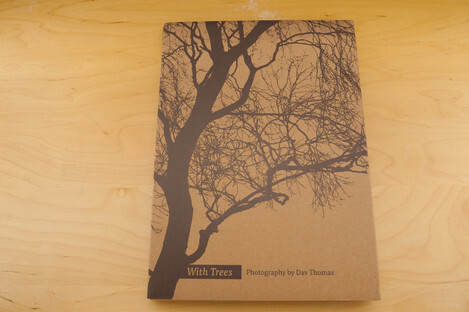 at http://withtrees.co.uk/. I'm probably biased but it's nice to be biased and justified..
p.s. a big thank you for the credit at the back of the book Dav - it wasn't necessary but it made my day!